The America First movement is not new; it dates back to isolationist policy from before WWII. The America First Committee (AFC) had almost a million members at its peak. 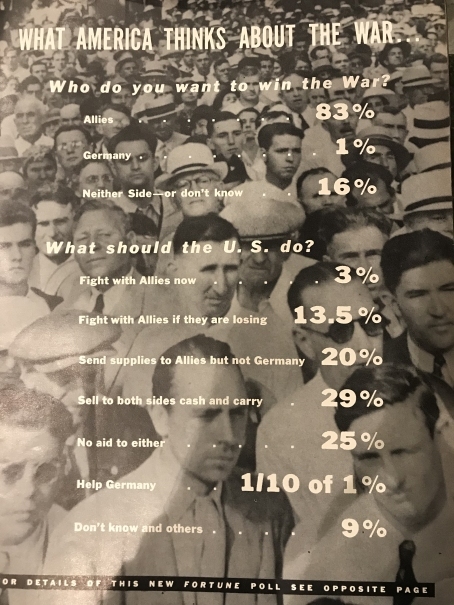 Most Americans didn’t want to get dragged into European wars, much as many Americans today don’t want to get dragged into foreign wars. It had a number of prominent advocates, like Charles Lindbergh, who opposed FDR’s support of Britain during WWII, through the Lend-Lease bill that provided both food and war materials to the Allies. The America First Committee of 1940 had a well-defined set of principles and policies. Yes, there was heated argument, charges of anti-Semitism, and bitter contention that divided the nation. But regardless of whether you were for or against it, at least 78 years ago America First actually stood for a set of well-defined principles. Moreover, it was a set of principles that, no matter how profound the disagreement, never divided us into two nations. The AFC made the following announcement just days after Pearl Harbor, not abandoning their values, but recognizing that while Americans may disagree on policy, they must ultimately come together as one nation (indivisible). I believe we live in a global society, so I don’t support the modern version of America First. But I feel cheated in that I can’t have any kind of intelligent discourse, or even passionate disagreements, as to just what it actually means today. Because unlike 1940, today’s America First amounts to little more than a slogan on a red baseball cap. Today there are no articulate leaders to present the issues to the American people, there is no thoughtful premise or policy. Like much of our policy today, America First doesn’t seem to go beyond what you can print on a bumper sticker. While the America First movement is just as contentious today as it was in 1940, the world stage was much different then. America wasn’t a dominant world leader until after the war; while the US had the largest pre-war manufacturing economy, Britain, Germany, and the USSR were the military superpowers. After WWII America found itself in a global leadership position in terms of trade, science, and of course as the bastion of Democratic values. The war-weary and Soviet-wary USA decided that in order to maintain America’s safety and security, while protecting our markets and resources abroad, we needed to keep a strong hand on global affairs. Often regarded (begrudgingly) as “the world’s policeman,” America’s position as a global leader was just as much about market growth as it was about security. While the Cold War led us to compete against the Soviets and Communism, America also aggressively pursued lucrative economic strategies under a thin veneer of charity and righteousness. We wanted the world to be stable so that trade wasn’t compromised. Regrettably, we even backed despots if they could maintain stability in their regions. We pursued heavy-handed tactics to ensure good trade relations and our global balance of power. After the collapse of the USSR security was no longer the primary driving force; we didn’t have to “keep the world safe for Democracy” as much as we needed to keep the world open to US capitalism. We weren’t the world’s policeman; we were the global mall cop protecting US markets. This is a capitalist argument against an isolationist America First policy. A more idealistic view would be that if we fail to use our strength to protect peoples and societies across the world, if we fail to stand up for “Truth, Justice, and the American Way,” corny as it may sound, then US influence will ultimately wane. We don’t always need to rely on troops: we exert just as much influence through the force of our economy (and the threat of economic sanctions). We exert global influence through many channels: our values, our charity, our science and technology, medical research, the beacon of our free speech, the influence of our free press, Hollywood movies, American music, literature, and art. But we cannot export American values if we no longer manufacture them at home. When we relabel our Free Press as Fake News, when we drop out of the Paris Climate Agreement, when we fail to educate and protect our own children, when we imprison the poor for being poor, when we execute citizens for being “of color,” when we turn away immigrants even though we are a country of such, we are effectively shutting down the moral and ethical factories that manufacture the values that make America truly great. What would the world be like if America is known globally only for its processed food, obesity, racism, and our contributions to global warming? Yes, we do need to take care of our fellow Americans. We need to put our children first above all else. But building walls and retreating from global influence will not make America safer or richer. And the world, no matter what our historic missteps of the past may have been, will nevertheless be a far poorer and more hostile place in our absence.